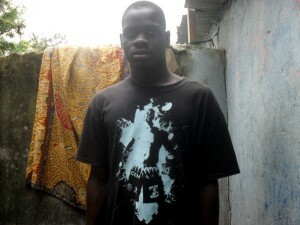 MAXWELL NIMENE just lost his caregiver in the BUDUBURAM REFUGEE CAMP. This is the lady, who took his hand and helped him escape through the gunshots, of the last Liberian war! I am only too sorry, we found him after her death, perhaps we could have helped this lady. She had no money, and no medical help. Countless hundreds die, premature deaths because they have no-one to help! Now Maxwell has no-one to care for him, and no food. He goes around begging to survive. 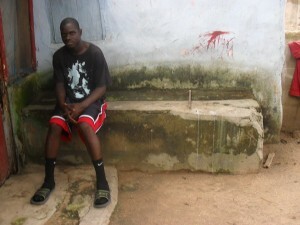 He knows he is Liberian and just cries to go home. In 2003 amid the gunfire Maxwell ran for protection. He was only 8 yrs old during this horrific memory. Since that day he has not seen his parents and has no idea if they are dead or alive. Perhaps his parents survived the war, no-one knows. I HAVE A HEART FOR THIS BOY WHO JUST TURNED 16. 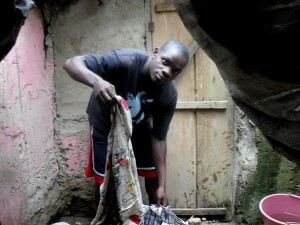 I want to help him home, have him live at My Father’s House, and send him to school. Can anyone help him? Maxwell sitting in his room at the Buduburam Refugee camp. Here he stands outside his room. Maxwell is getting ready to have a bath, in the pink bucket. They pay for their water on the camp. Obviously they cannot bath every day, there is no money. Picture living on a camp, it is smouldering hot, there is every disease imaginable with flies from the sewer buzzing on your food. Yes, this is where we go every year to help “the least of these” Provision of Hope has already helped hundreds of people in this camp. I pray we can do something for Maxwell too. Any donation towards Maxwell’s needs would be most appreciated! THIS IS HOW WE MAKE A DIFFERENCE… ONE AT A TIME! Mother Teresa said it well ” If you cannot feed 100 feed JUST ONE!